WASHINGTON, DC, August 3, 2011 (ENS) – Conservation groups working across the Gulf of Mexico are supporting a bipartisan bill in the Senate that would direct to five Gulf states the billions of dollars in fines that may be imposed on BP and other companies found responsible for the last year’s oil spill. Under current law, most of the fines would go into the U.S. Treasury for general spending, rather than going towards restoration of the Gulf. The Senate bill, S. 1400, the Resources and Ecosystems Sustainability, Tourist Opportunities, and Revived Economies of the Gulf Coast States Act of 2011, is known as RESTORE the Gulf Coast Act of 2011. It is currently before the Senate Environment and Public Works Committee for a vote. The bill establishes the Gulf Coast Restoration Trust Fund. The legislation would credit to the Trust Fund amounts equal to 80 percent of all administrative, civil, and criminal penalties paid by a responsible party in connection with the Deepwater Horizon oil spill. Triggered by an explosion and fire aboard the Deepwater Horizon oil rig April 20, 2010, the 4.9 million barrel oil spill from BP’s damaged wellhead a mile below the surface of the Gulf fouled waters and coastlines in the five states. The well was finally capped on July 19, 2010. The conservation groups have submitted to the White House a strategy that federal, state and local governments can take to restore the region’s natural systems and help communities that rely on the Gulf for their survival. 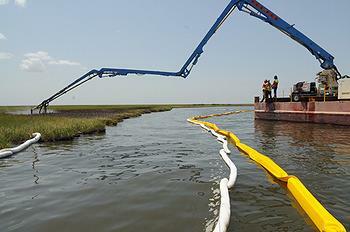 The strategy would be funded by the penalties credited to the Gulf Coast Restoration Trust Fund. On Monday, the groups delivered their recommendations to the Presidential Task Force on Gulf Coast Ecosystem Restoration, created by President Barack Obama by executive order last October. The task force must produce a comprehensive plan “to effectively address the damage caused by the BP Deepwater Horizon Oil Spill, address the longstanding ecological decline, and begin moving toward a more resilient Gulf Coast ecosystem.” The task force is scheduled to announce its plan on October 5. The recommendations were submitted by The Nature Conservancy, the Harte Research Institute for Gulf of Mexico Studies (Texas A&M) University-Corpus Christi, National Audubon Society, Ocean Conservancy, National Wildlife Federation, Environmental Defense Fund, and the Lake Pontchartrain Basin Foundation. The groups recommend that restoration activities should provide both environmental and social benefits. They must ensure sufficient delivery of freshwater flows to the Gulf in order to maintain ecological health of bays and estuaries and restore restore populations of endangered marine mammals. The groups rcommend construction and operation of a series of large-scale diversions of freshwater and sediment from the Mississippi River sufficient to build and sustain Delta wetlands to provide storm surge protection for people and restore habitat for economically vital fisheries. They would implement management plans for oyster reefs that support fish production, water filtration, nitrogen removal and coastal protection. “We hope our recommendations will help the task force develop its strategy, but the task force can’t implement its strategy without the necessary funding that the RESTORE Gulf Coast States Act provides,” said Courtney Taylor, policy director for the Mississippi Delta Restoration project at Environmental Defense Fund. If the RESTORE Gulf Coast States Act becomes law, 35 percent of the penalty money would be evenly split among the five Gulf coast states. 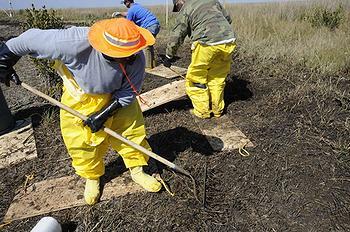 Thirty percent goes to the Gulf Coast Ecosystem Restoration Council and another 30 percent is divided among states based on those most heavily affected by the spill. The remaining five percent would be allocated equally for Gulf science and fisheries programs. 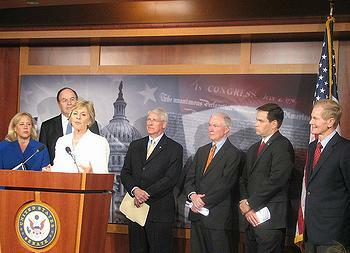 Representatives of two of the affected Gulf coast states introduced the bill – Senator Mary Landrieu of Louisiana, a Democrat, and Richard Shelby of Alabama, a Republican. “The Deepwater Horizon explosion was a tragedy that took the lives of 11 men and devastated an already fragile coastline,” Senator Landrieu said. “While there are many things that must be done to respond to that horrific incident, the RESTORE the Gulf Coast Act of 2011 is one of the most important things that needs to be done. 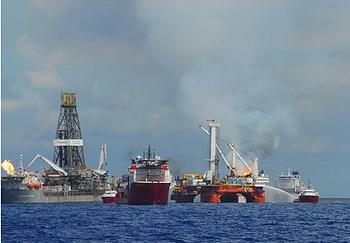 “BP will have to pay a serious fine to the federal government. We believe that at least 80 percent of that fine should go to the area where the injury occurred to get the taxpayers off the hook and put the polluters on the hook for picking up the tab,” she said. Senator Shelby said, “This legislation allows for great flexibility in the allocation of recovery funds to ensure that the penalties our state is owed are distributed in the best interest of Alabama’s coastal communities. Other co-sponsors of the RESTORE the Gulf Coast Act of 2011 are Republican Senators David Vitter of Louisiana, Thad Cochran and Roger Wicker of Mississippi, Marco Rubio of Florida, Kay Bailey Hutchison of Texas, and Democrat Bill Nelson of Florida. Senator Barbara Boxer, a California Democrat who chairs the Senate Environment and Public Works Committee, was instrumental in forging agreement on the bill and says she will take up the measure in her committee quickly.